One of the most interesting extra features to Dance Dance Revolution is the customization it affords to savvy players. There are a whole lot of different features at your disposal, depending on the Mix you're playing, and what games and hardware you have at your disposal. Essentially, you probably shouldn't even be reading this FAQ unless you've got access to a DDR machine with memory card slots on it. Here's what they look like. Each player has his/her own slot. 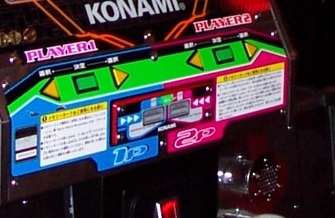 When the slots are set up properly in a DDR machine, the game's Attract Mode will feature an "advertisement" mentioning the fact that this DDR machine works with memory cards. If you don't see this ad, then your machine's slots are not set up properly. Also, after credits have been inserted but before the start button has been pressed, a notice message will appear across the DDR logo on the title screen, indicating that now is the time to insert your memory card. These are PSX (PSOne) memory card slots *only*. They will only work with the original 128 KB PS1 memory cards, and with PocketStations. You cannot use a PS2 8MB (or otherwise) memory card with these. Generally speaking, you should stick with only 1st-party (Sony brand) memory cards, or the PocketStation. Other brands seem to have a tendency to fail to work 100% in DDR memory card readers. That's not to say they won't work, though. I've got a MadCatz purple and a Performance 2x memory card that both work flawlessly in my local DDR machine, so your mileage may vary. A note about the Performance 2x memory card and other "multi-bank" cards - Don't bother with them unless you have your Link Data stored on the default memory page. You could get data loss if you try to switch memory pages while the memory card is being accessed. Whenever you insert a memory card into the memory card slots, a message should appear at the very bottom of the screen that says in blue letters "Inserted" and shortly afterward, "Ready". This only means that your memory card has been successfully accessed and indexed. If there is a problem with your memory card, the text will be red instead and indicate that there was an error. Once you've inserted your memory card and received the success message, you should go ahead and leave it alone until the end of the game. After you've finished your round, the announcer will say "Don't touch the memory card!" while it saves data to the card (if you have Link Data). After the data has finished saving, the announcer will say "Now pull out the memory card". Pulling out the memory card will cause the message "Removed" to appear in blue letters at the bottom of the screen, and the game will go back to Attract Mode. As for acquiring memory slots for a machine, kits can on rare occasion be found on eBay, but they generally run in excess of $1500. If you're interested in acquiring a memory card kit, it's often easier to locate a machine that has slots already and just upgrade it. Furthermore, it can be rather difficult to find an existing listing for a memory card kit on eBay, as you'll get loads of hits for video cards, flashcard equipment for PCs, and the like. Some memory slot kits also include a spare Flash ROM card (the factory default is a 32 MB ATA PCMCIA card made by AMD/Fujitsu and rebranded by Konami - some Dancing Stage machines have a 16 MB card). These cards can be used to store player-created Edit Data, and also include some of the program data for the game itself. The DDR cabinet contains a single card by default, which is used to store program data, score records (if applicable), Konami Original step data, and user-created Edit Data. The Flash ROM cards can be enabled/disabled via the Operator Menu, in case an arcade operator needs to disable them but can't/won't open the cabinet to remove the cards. The flashrom is 32 MB, but only 8 MB of this is allocated for edit storage. In DDR Extreme, you can store up to four edits per song - two Singles/Couples, and two Doubles. It's not yet possible to replace this ROM card with a larger ATA flash card. Link Data is a feature that lets players save scores while playing in the regular and Oni game modes. Link Data also allows you to automatically insert your initials if you achieve a ranking score on the machine you're playing on (5th Mix or higher). Link Data is a lot of fun, since you can keep track of your score progress in the game, and bring your scores with you wherever you go. In order to use Link Data on an arcade machine, you need one of two things - You either need a hardware tool that can read/write memory card images, such as a DexDrive, or a game copy which can match up with the machine you plan to play on. If you have a DexDrive, you can go to our Songlists, Codes, and Saves page to download a file containing the Arcade Link Data file(s) you'll need. Click on the 'Saves' link for the arcade machine you usually play on, and then select a file to download based on what kind of memory card hardware you have. Most people will have DexDrives, and so you can probably get by with just the .GME file. Download this file, unzip it, and use whatever software you find appropriate to write the memory card image to your memory card. I recommend PSXGameEdit - You can find more info about it, also in the Links section at the end of this FAQ..
Having a DexDrive is very useful in general for DDR memory card usage, both for getting started with Link Data as well as using edits made by other people, or edits made yourself via DDREditMax or Edit Hacking (described below). InterAct stopped producing them a couple of years ago, but quite a few GameStops and EB locations still have them in a back corner somewhere, usually for around $10-$20. You might also luck out at Walmart. If not, they do frequently appear on eBay. WARNING - If you're going the memory card writer route, be sure to back up whatever you have on your memory card before writing the new files! Some programs, like PSXGameEdit, let you write individual files to a memory card, but others, like the InterAct DexPlorer, will only write an entire memory card image, and they won't be very clear about it either. Be sure to back up your data, lest you accidentally overwrite your wife's 40 hours+ Xenogears save file! If you decide not to use a DexDrive or some other device, you'll need to use one of the Japanese console versions of DDR to create a Link Data file. New Mix Link Data is designed for machines beyond 5th Mix. It is what you need to use Link Data on DDRMAX2 or Extreme. You must have 5th Mix in order to create Arcade Link Data for DDRMAX or newer editions. This is easy. Simply play a game and save a System File to your memory card. Take this card to a 2nd Mix machine with memory card slots, and put it in before starting your game. The machine will modify the file for you. Once your game is complete, take it out and bring it home. When the game loads your System File, you'll find new relevant menu options unlocked. As a note - I only know of two 2nd Mix machines in existence which have memory card slots installed. One's on a military base in California, and the other is in Michigan, and I have as of yet been unable to find anyone willing to help me obtain an unlocked System File to use with 1st Mix. While I doubt that this will disappoint anyone, it does, nonetheless, put a cramp on my efforts to completely document memory card features. If you're willing to help me out, please contact me. You'll need a DexDrive. As a side note, the User Support option in 2nd ReMix and 3rd Mix PSX do*not* unlock these options. A trip to the arcade is required. Same with 1st Mix, except that the System File you'll be creating is made by 2nd ReMix, and you'll load the file in a 3rd Mix machine. System Files for 2nd Mix Arcade and 3rd Mix Arcade are both two blocks each. 3rd Mix operates much in the same fashion that 2nd ReMix does, except that Link Data information isn't actually stored in your System File. Creating the file itself takes a lot of leg-work, and I can't accurately document the process since I don't have a 4th Mix machine nearby with slots to test it on. I recommend that if you're really interested in using Link Data for 4th Mix or 4th Mix Plus, download my file from the Internet at the links list at the end of this document, and just use that. Link Data will permit you the use of Custom Nonstops and Internet Ranking, but since Internet Ranking is closed for all the current DDR versions available, that's pretty much it. Select Arcade Link from the title. From here you can select either 4th Mix or 5th Mix. Take note that the game will actually only create a file useable in 4th Mix Plus. To create a file for 4th Mix, you will need to see the 3rd Mix PSX section above. Select the one which corresponds to what you want. Then select "Link Data Create". If you select 5th Mix, you can also enter initials to automatically be displayed if you get a score ranking. This option will be grayed out until you either Load or Create a data file. 3rd<->4th Mix Link Data requires one block of memory card space. Select Arcade Link from the title. From here, select 5th Mix. Kinda silly to only have one version on this selection screen...Next, select Link Data Create. Once you've created a file on your memory card for the Link Data, and have subsequently Loaded it, you'll be able to edit your initials for the score ranking by selecting the appropriate option from the menu. Be sure to save your Link Data file (s) after doing this. You can also view your Internet Ranking passwords earned at the arcade, and your score records saved from 5th Mix. All three options (Name Entry, Internet Ranking, Song Records) will be locked initially, but will be unlocked after Loading your Link Data. Select Arcade Link from the title. From here you can select either 5th Mix or New Version Link. Select the link version you require (based on the machine(s) you play on), and select Link Data Create. Once you've created a file on your memory card for the Link Data, and have subsequently Loaded it, you'll be able to edit your initials for the score ranking by selecting the appropriate option from the menu. Be sure to save your Link Data file (s) after doing this. You can also view your Internet Ranking passwords earned at the arcade, and your score records saved from the arcade machines. All three options (Name Entry, Internet Ranking, Song Records) will be locked initially, but will be unlocked after Loading your Link Data. NOTE - If you download the Link Data files from our Songlists, Codes, and Saves section or from AaronInJapan.com, save some song records, and then decide that you want to use the Initials Entry function, be sure to use Link Data Load to load your scores, *then* edit your initials, and *then* save. I overwrote my memory card's New Version Link Data file after making one for my wife, switching memory cards, editing the initials, and then re-saving (without loading my own scores). 5th Mix Data requires two blocks of memory card space. New Version Data requires two separate blocks of memory card space. If you only plan to play on DDRMAX or higher, and not a 5th Mix machine, you do not need to create a separate 5th Mix Link Data file. As mentioned above, to use your Link Data file, insert your memory card on the title screen, before you hit the green start button. When the memory card is inserted, a small message will appear across the bottom of the screen saving "Inserted" and then "Ready". This message appears in blue letters in the space where the game normally indicates the number of credits inserted. Once your Link Data is loaded and you proceed to the song selection menu, you'll notice that the screen looks a bit different. The screen will show you your best score for the selected song/difficulty (provided you have a record saved), and the associated grade. Bear in mind that the Link Data records high *scores*, and not high *grades*. If you get a high score with an A, and then get an AA on the same song but with a lower score, the game will retain your A record! After finishing your round and viewing your final scores, the announcer will say "Don't touch the memory card! ", at which point the game will save your new scores to the memory card. When the saving is finished, the announcer will say "Now pull out the memory card..." and the game returns to Attract Mode (assuming there aren't credits already in the machine). For whatever reason, Konami elected to make DDR Extreme technically incompatible with New Version Link Data files from Max/Max2. Extreme will load your scores, but when it saves them, it will write a different title text line to the memory card, which will cause DDRMAX and DDRMAX2 to refuse to read the file. Your scores will remain intact (No guarantees for Internet Ranking saves for Oni/Nonstop, though), but the file will no longer be useable in the older machines. I have written a program that circumvents this limitation, however. A link to download it can be found in the Links section at the end of this FAQ. Edit Data is a feature that lets you create your own step patterns for existing DDR songs and play them at home or at the arcade. Additionally, you can also use step patterns provided in the console versions of DDR via the Data Bank feature, in case you're not feeling very creative yourself. Using Edit Data does not require you to have/use a Link Data file. Generally speaking, in order to create an edit file for a song, pop in the Japanese mix that the song appeared on, choose the Edit option from the menu, select the song, and start creating steps. Extra Mix and 5th Mix also include an option on the main menu called "Data Bank". This option presents you with hundreds of different step files for songs throughout the DDR series (including songs which aren't actually in the Mix you're playing). Exporting these stepfiles to your memory card is pretty straight-forward. First, select the Data Bank feature. If you're in 5th Mix, you'll be presented with a list of "Blocks" of ~500 edits each. Just select one to start browsing. Now, in both versions, scroll down to find the song you want. On the right, you'll see the CD covers of all the DDR versions up to 5th Mix, the ones containing the selected song being highlighted. Edits are contained here for all the songs prior to 5th Mix (and 5th Mix included, if that's the version you're using), including the Club Append discs, Best Hits, and Extra Mix. A number to the right of each listing in the menu indicates how many different edit steps that block contains for this song. Select the song you want, and a list of the available edits (in this block) will drop down. On the right, you'll see the step pattern for the song. You can hit left/right on the D-pad to scroll through the steps, and up/down to select the individual edits. Once you've selected a step set that appeals to you, hit Circle and you'll be taken to a screen where you name the edit you're downloading. Once you've named it, select End (in the lower righthand corner of the letters area). Now you'll be asked to pick a slot on the memory card for it. You can either pick a free slot, or save over an existing Edit that your memory card contains. Select the slot with Circle, and the edit will be saved. Edit Steps, regardless of whether for normal songs or Long Versions, Single/Double/Couple/Solo, will take a single 8 KB slot on your memory card. Thus, not including Link Data, you can have a maximum of 15 Edit Data files on your memory card. As I mentioned previously, Link Data is not required to use Edit Data! As far as I know, memory card readers only work with standard DDR machines. I know of no Solo machines with memory card slots, and thus, to my knowledge, you cannot use Solo step edits in the arcade. The Edit feature lets you make Solo steps specifically for use with 4th Mix, just for clarification. As said before, many DDR machines with memory card slots feature a Flash ROM card. If installed and enabled in the Operator Menu, the owner of a DDR machine can preload his/her system with edits from a memory card. To do this, open the operator menu, select Memory Card Options, and then select Store Edit Data. The machine will then scan your memory card for edits and allow you select which ones you want to copy onto the machine. Otherwise, to use your edits, you'll just need to put in your memory card when the game starts, generally after you put in your credits but before you hit the Start button. Using Edit Data steps is different depending on which version you're playing on. In 2nd Mix and 3rd Mix, hold down the Start button after you the song you want to play which has an Edit available on the memory card (similar to how one enters the Options menu in a DDR Extreme game). If you only see "Official", then this means that your edits were not loaded properly. Otherwise, you should see the name of your edit(s) alongside "Official", and possibly some preloaded steps that either the operator has installed, or that came with the game. Select your steps and then hit the Start button to begin. In 4th Mix and 4th Mix Plus, you will need to choose Link Mode at the opening menu, and then Edit Data. From there, the game will enter the normal song-selection screen. When you select your song, at the point where you are prompted to select a difficulty, you will see a button labeled "Edit Data" where the Battle Mode button is usually. Select this button and then your edit and begin your game. In 5th Mix and later, to use Edit Data steps, select the song you have edits for on the song selection menu, and then hit :right::right: to open the Step Selection menu. If you change your mind about using Edit Data, hit :left::left: to close the menu. Since Edit Data steps are unofficial, Link Data scoring is disabled whenever you use Edit Data steps. If you have an Extreme without memory card slots, you can still install edits on the machine, but you will need to have administrative access to the machine. The Extreme install CD contains a 32 MB file which is an image that is written to the flashrom whenever Extreme is installed. I've written a program that modifies this image file to inject the edits of your choice. You can find that program and information on using it here. LOKI has written far more than I could ever hope to write about this topic. You can view LOKI's Edit Hacking FAQ here. What is Edit Hacking? Edit Hacking lets you make steps for songs that haven't appeared in a home version. Edit Hacking also lets you make steps with Freezes for songs in DDRMAX2 and higher that appeared in an older mix where Freezes weren't supported. Finally, Edit Hacking allows you to create Edit Data in an American version of the game and convert it so that it works in the Japanese console and arcade games. There's a number of different things you can do with DDR involving the use of a PocketStation. I don't have a PocketStation of my own, so I'm not really able to document this very well, but there's an Edit Preview app available (called DDRTool) which lets you preview Edit Data files saved on your PocketStation, and there's also a PocketMail program which lets you send messages to DDR players whom you play with, provided they also have a PocketStation and the appropriate file set up. Nonstop Order is an interesting function available in the first four DDR arcade games that allows you to create your own custom Nonstop course from the songs available in the mix. Select Nonstop Order from the main menu, and you'll be shown a screen that will let you load existing nonstops for editing. You can also load Edit Data from the memory card here (you can use your Edit Data in your nonstop, but you must use Edit Check first). The process for setting your Nonstop up is pretty self-explanatory, other than the course length. Select the song you want, difficulty, Edit Data if you want it, and any default modifiers that you want to apply to the song. So, yes, if you feel like it, you could set up a 3rd Mix nonstop course consisting of the four Paranoias all on S4R (Stealth Shuffle SSR). Once you configure your Nonstop the way you want it, save it back to the memory card. You can save up to three custom Nonstop courses per memory card. When the arcade machine reads your memory card, it will index all available Nonstop courses, meaning that if you're playing in Versus, and your opponent has a memory card, you can have up to six Nonstop courses at your disposal! This function, available in 2nd ReMix and 3rd Mix, allows you to create your own custom arrow designs for use in the arcade. As far as I know, it's only available for use in the 2nd Mix and 3rd Mix arcade machines. To create arrow patterns, you must have the Paint option unlocked in the main menu - It's one of the last things you unlock in both games. If you have both games, I recommend using 3rd Mix's User Support function to unlock all of 2nd ReMix's hidden features so that you don't have to play over and over just to unlock Paint. You'll see two sets of arrows when you enter the Paint screen - This is so that you can use Paint data in Doubles mode if you so desire. When playing in Singles, only the first four arrows will be used. I assume that, if two people are playing in Versus and both use Paint data, that it will use the first four arrows of both. To use Paint data in the arcade, insert your memory card at the title screen as usual, and hold down the Start button when you push it to begin the game. If you're wanting to play Doubles, hold down the arrows as you hit the Start button, but continue holding the start button as the game loads data from the memory card. Paint data files take one block on the memory card. In 4th Mix and 4th Mix Plus, using a memory card with Link Data will automatically put the machine in Link Mode whenever you start a game. If your performance qualifies for Internet Ranking, the game typically will present you with a password on then screen for you to write down. If you have a memory card with Link Data inserted, however, the Internet Ranking password will automatically be saved to the memory card. Take your memory card home, pop in 4th Mix in your PSX, insert your memory card, and select Arcade Link. Select 4th Mix Link, and then Load Link Data. After doing so, you the Internet Ranking option should now be unlocked on the menu. You can go in this menu, and show your passwords so that you can (theoretically) enter them on the Konami website. Of course, this is merely for the record, since the Konami 4th Mix Internet Ranking website is no longer available. Newer versions of DDR beyond 4th Mix Plus also offer Internet Ranking, and the procedure for accessing these records is similar, except the Link Mode step is not required. If you would like to view Internet Ranking data for 5th Mix or newer versions, load the appropriate Link Data file using 5th Mix PSX, and select the Internet Ranking option to view your passwords. Similarly to 4th Mix, Internet Ranking is closed for all versions of DDR through Extreme, so this is only for the record. You can now get Link Data files for most (and soon all) of the game versions you can use them with at our Songlists, Codes, and Saves page. Looking for a DexDrive to use? They do frequently appear on eBay. You might also look at an online retailer or two such as NCSX, which (as of the publishing of this FAQ) has some in stock for $19 plus shipping. PSXGameEdit is a fantastic little utility written by Lars Ole Dybdal. It allows you to use a DexDrive or one of many other types of PSX memory card readers on a PC without the DexPlorer software. Not only that, but it's far more versatile than the DexPlorer software, as it lets you read/write single gamesave files instead of handling the whole memory card image. It's quite useful, and pretty much an essential tool for anyone handling edits, or using my Link Data Converter. Looking to use a New Version Link Data file between DDRMAX/DDRMAX2/Extreme? You'll want to use my Link Data Converter program, then. It's pretty easy to figure out and use. Note that it only handles .MCS files, so you'll need PSXGameEdit to make use of it. I don't know enough about the PSX memory card format to code support for it directly in, nor do I think enough people will ever use my program to merit me circumventing the need for such a useful tool as PSXGameEdit. StepLoader lets you inject edits into a DDR Extreme flashrom image so that you can add edits to your machine without having memory card slots. You will need to burn a new Extreme installation CD, and thus you will need administrative access to the machine (IE - you own it or operate it). For details on this program and where to find it, click here. Thanks to Brian Ho, MJEmirzian, and Sevastian for their extensive help in documenting the 5th Mix and New Version Link Data formats. Thanks to LOKI and Catastrophe for all their hard work researching the Edit Data memory card format and the machine code information. Thanks to DC, GurtyGurt, and GameFAQs for information about teh old skool Dee Dee Arr.